Hi, I am interested in your 1966 Chevrolet Nova (stock #5072-CHA) listed on Autotrader for $38,995. I'd like to get more information about this vehicle and confirm its availability. The 1960s were all about installing powerful V8s into lightweight cars, but not everyone got the idea. 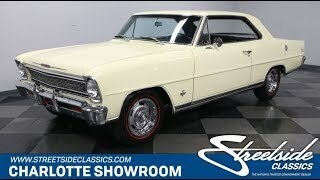 Thats what makes this highly original 1966 Chevrolet II Nova SS so special. Not too many had a 327 V8 installed at the factory, so this coupe is fast and rare. Someone took very special care to make sure that everything on this Chevy II Nova Super Sport is so well preserved. The exceptional fit and finish help emphasize the Novas clean, straight lines, and the factory-correct shade of Lemonwood Yellow benefits from a professional respray. Keeping a low profile was vital to the Novas street cred, so the classic and understated color lets the hardware underneath do all the talking. Of course, Chevrolet left hints at performance on every side of the car, with special SS badging on the chrome grille, and bright rear panel, as well as the elegant Super Sport script on each rear fender. There were even special hubcaps in this package. So it would be tough to call this car pristine, and authentic, without all these elements in place. Purely stock is the way to go with a car of this caliber. So the correct bucket seats, with a chrome center console in between them, is another hallmark of the SS package. Everything looks factory original, from the chrome accents on the black door panels, to the heat/defrost controls, to even the push-button AM radio. The woodgrain steering wheel gives this all a nice upscale touch, and beyond that are the wide, clear gauges you love on a 60s American classic like this. Lift the hood and youll see a refreshingly unmolested engine bay. The 327 cubic-inch engine shows all signs of being the same one installed at the Willow Run plant in September, 1966. This L30 motor is sought-after, and a somewhat rare option today. Compared to the L79, this one was happy to trundle through traffic without complaint, and has a fat bottom end that makes it the ideal street sleeper. It breathes nicely through a newer performance H-pipe exhaust system with Flowmaster mufflers. If this SS is starting to sound like the perfect mix of comfortable cruiser, and intimidating muscle car, youd be right. Thats why it has great features like the stout powerglide transmission, power steering, and power brakes. This is a Nova SS that was a sleeper when new, and now its a preserved with the original owners manual and maintenance receipts to prove it. Its a head-turning classic coupe at an affordable price. Call today! !